The outside of your property and the area surrounding it can be every bit as important as the indoor sections. With a bit of imagination and professional work, the surrounding landscape features can outshine the main building. Our local team works with pavement, pools, and everything in between, in order to create aesthetically pleasing and utilitarian outdoor spaces to your specification. If you need something added, removed, or repaired on your land, our experts are just a phone call away. When you want to add an artificial feature to an outdoor patch of land, the first step is usually to cover the ground over with a durable and well dug-in surface made of rock, brick, tile, or other materials. Pavers can lock tightly together with a cement matrix to create a smooth and contiguous surface for driveways or patios, or be spread out a little to create a scenic walking path that lets a little bit of nature flourish between the cracks. On top of that, our team can add extra features to make the area more pleasant and useful; anything from decking to standing columns and even gazebo roofs. Working with a variety of construction materials, our team prides itself on the flexible modifications they can make to any piece of land. Decks, patios, and water features are all on the menu with our company, as well as the more fundamental driveway and walkway paving services. Rest assured that if you have a design idea in mind, our experts will work with you to bring it to life. The most important thing the outdoor parts of your property need to do is to allow people to travel on foot from one area to another. While they do have a functional purpose, paved walkways are also great for adding attractive traits to your property. Flagstone paths, or ones made of stamped concrete simulating the appearance of bricks or tiles, can add a lot of charm and visual attractiveness to the landscape. Our experts can build new walkways to your complete satisfaction and repair or replace old ones as well. Laying down a paved feature is a lot of work, but removing an old one that you don’t want anymore can also be difficult. Each paving stone needs to be pried or broken loose and then lifted and carried away, and the soil needs reshaping or replanting afterward to cover the traces. Fortunately, our team has the expertise needed to make this kind of task as fast, efficient, and inexpensive as possible. 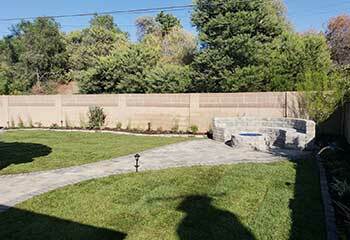 If you need to have some landscape section removed, reshaped, or remodeled, we’ve got your back. While our team routinely builds simple walls and walkways, our expertise goes much further than that. A sheltering roof on support columns can make your deck, patio, or outdoor kitchen usable even during periods of bad weather, and the scenic image of a gazebo rising above your garden or courtyard is photogenic in a way few other things can be. Pergolas, sheltered walkways, and other sorts of open air structures are excellent when it comes to adding utility and beauty to any home or business. With our help, you can turn a simple garden into a palatial retreat. Outdoor pavement can be enhanced by adding furniture like benches, tables and counters that will turn a simple patio into a cozy open air dining room. 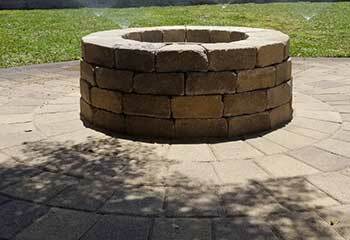 Barbecue pits are another popular addition to patios, courtyards, and paved garden spaces, and range from a simple grill holder with a few tables nearby, to a full-sized kitchen island of counter spaces and oven or refrigerator slots. If you plan to host parties or other major events, an outdoor kitchen will make hosting and catering a whole lot easier. From large fish ponds to tiny decorative brooks or abstract fountains, these sort of features can improve the appearance of just about any outdoor space. If you need to have a waterproof deck installed, or want to improve the surrounding landscape with some unique centerpiece, what could be better than eye catching water features? You may want to consider having the feature built into a raised deck to protect it from dirt and minimize the excavation work, as well as to make it easier to set out deck chairs or other furniture around it. Find out what our team can do for you by checking out our latest projects. When this customer’s retaining wall started to weaken we were able to repair the damage and strengthen the structure. Learn more here. We successfully installed a BBQ island onto an existing patio. Click here to find out more about this project. 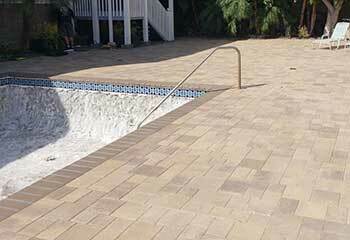 This customer wanted his paver pool deck to undergo comprehensive maintenance. Find out how our team helped. The retaining walls you built in our garden made a huge difference. My wife and I really appreciate all your hard work. Thanks again! I’m so happy with the work you did installing a new slate deck around our swimming pool. It looks fantastic and feels very safe and not slippery. Thanks for doing such a great job. The stamped concrete driveway you installed in front of our house looks amazing. The design looks so real people thought it was real bricks. Can't thank you enough.